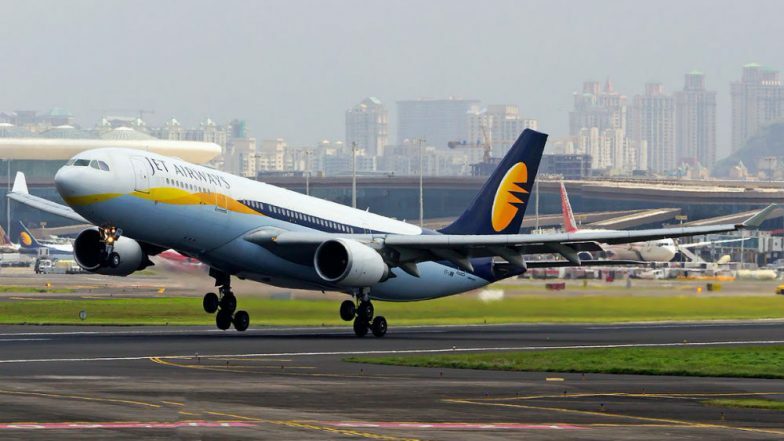 New Delhi, April 12: Cash-strapped Jet Airways is currently flying less than 50 domestic flights, a senior official of aviation regulator DGCA said on Friday. "Jet is currently flying less than 50 domestic flights. The airlines has 16 aircraft available with them for flying," the official said. The official did not give the actual number of aircraft that are currently flying. The official said that the airline has suspended its international operations till Monday. As the crisis in the private airline deepened, the Prime Minister's Office has called an urgent meeting to discuss the situation, official sources said. SpiceJet on Friday announced it will induct 16 Boeing 737-800 NG aircraft on dry lease to bring down flight cancellations and expand the airline's international and domestic presence. Jet Airways Crisis Continue as Indian Oil Corporation Denies Fuel to Aircraft Over to Non Payment of Dues. The availability of flights was also hit by pulling out of SpiceJet's 12 "737 Max" aircraft in March over safety concerns following an Ethiopian Airlines plane crash on March 10. "SpiceJet will induct 16 Boeing 737-800 NG aircraft on dry lease and has applied to the Directorate General of Civil Aviation (DGCA) for a No Objection Certificate (NOC) to import the aircraft," the airline said. "Subject to regulatory approvals, the aircraft would begin joining SpiceJet fleet in the next ten days," it added.